Mohammad Hafeez, in his first test innings in two years, smashed a century ensuring that no one takes away the title of Comeback King from him. Hafeez' 126 against Australia in the first test in Dubai was his 10th test century. He has now joined an elite club of Pakistan openers with 10 or more test centuries, whose only other member is Saeed Anwar! Can you believe that? No test opener from Pakistan has scored more than Saeed Anwar's 11 test hundreds and Hafeez is only one century away from equaling that feat! Considering that Australia, England, and India have each produced a couple of openers with more than 20 test hundreds. And at least 1 opener with 30 test hundreds, I was quite surprised. But then, Pakistan hasn't really had that many stable openers. We are never patient enough with our openers and a couple of bad matches or 1 bad series and the selectors move on to the next one. In the middle order, batsmen seem more safe. They can go through more failures than openers can. Case in point, Mohammad Hafeez, who was kept away from Pakistan's test side for two years despite scores of 224, 197, 151, 101*, 98, 96, 51, 42*, 42, 40 in his last 10 tests! He really only failed in one test in England (0 and 2) and he was dropped. Doesn't seem right for a batsman who has arguably been Pakistan's second best opener in tests ever! He has the third highest runs tally, the second highest number of test hundreds, and the third best average among all test openers produced by Pakistan. Hafeez has been a world class opener for Pakistan, more so since November 2010 when he made his return to the Pakistan test team under Misbah. 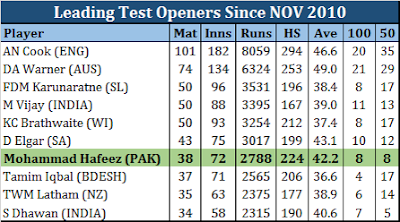 Since that time, Hafeez is among the best openers in the world! His average of 42.2 in this period is behind only that of Alastair Cook's, David Warner's, and Dean Elgar's. It really makes me wonder why he was dropped from the team. 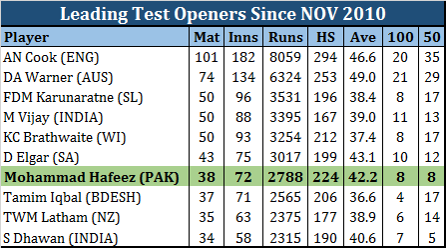 What further strengthens Hafeez' case as the first choice test opener for Pakistan is the fact that he has been involved in 7 out of the 13 century opening stands and 11 out of 15 fifty opening stands for Pakistan since 2010. Hafeez has easily been Pakistan's best test opener since 2010 and I really cannot understand what resulted in him being dropped. Please save me all the bull crap about his runs coming on flat decks and his centuries against weaker opposition. Hafeez has test hundreds against all test countries that he has played against, barring South Africa, and the only country he hasn't played test cricket against India. For each one of his 10 test hundreds, there was another opener in the team also, playing the same opposition in the same conditions as Hafeez. Mohammad Hafeez' comeback was so strong that he put on 205 runs for the opening wicket with Imam-Ul-Haq, which was Pakistan's 5th opening wicket stand of 200 runs or more, and the 6th highest test partnership ever against Australia. I wonder how long Hafeez will last this time, but if he maintains the form that he displayed in Dubai yesterday, he will be on top of the list of Pakistan's test openers by the end of the Test series against New Zealand.